Happy April Fools’ Day everyone! Today is all about silly jokes, hilarious pranks, japes, larks, and general tomfoolery, and so in the spirit of all things jocular, I thought I’d share some ideas for suitably rib-tickling reading. This book is guaranteed to give you the giggles, no matter what your age (this is an absolutely true scientific fact because we’ve tried not laughing and it’s impossible). Wendy Quill could be forgiven for assuming that she would get the lead part in her school production of Peter Pan and Wendy – after all, it literally has her name on it. 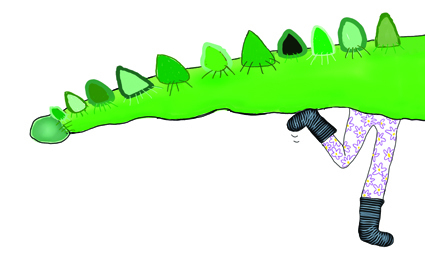 Much to Wendy Quill’s bewilderment, this doesn’t quite work out, but that doesn’t stop her from making a stunning debut as the crocodile’s bottom! The book is written by the hilarious Wendy Meddour (who really did miss out on the lead role of Wendy in her school play) and is illustrated by her incredibly talented daughter Mina May (aged 11). Hugo the hippo loves to do water ballet – it makes him unique – but Bella the bird won’t stop copying him. The friends nearly end up falling out – that is until they realise that they are in fact doing the most incredible synchronised swimming together. This quirky storyline is told completely through dialogue, so it’s really fun to read aloud together and do silly voices. To top it all off, you get to enjoy seeing a hippo dressed in swimming hat, chequered shorts, goggles, flippers, and armbands! Moustaches can be funny. Drawing moustaches on photos – also funny. That is unless the photo you choose turns out to be of the resident psycho at your new school. This is exactly what loveable rogue Oz does when he moves to a new town, and it sets in motion a chain of events which will see him make both friends and enemies along the way. With both serious moments and touches of pure comedy, this book has it all. There’s even a soundtrack! What did the stag say to his girlfriend?